PARKING: From route 16 / 25 in Ossipee turn onto Pine Hill rd for 3.5 miles to a Y junction with Connor Pond Rd. Continue 0.5 miles to Marble road following it 0.7 miles to parking on the right. The parking area is directly across from a cabin and marked with three parking signs with room for 6 to 8 cars. the (unmarked) trail head is 100 feet further down the street on the right. The revised parking area is not shown on this map. Parking can be found on Marble Rd just before the star marking the trail head. 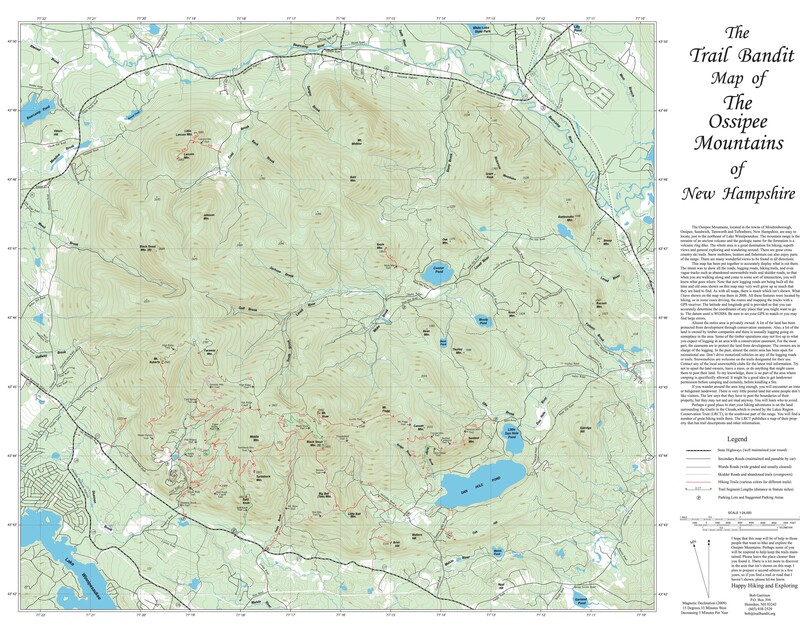 A complete map of the Osspiee range can be found by clicking this link. DESCRIPTION: We didn't encounter any trail signs or confirmation along the way and often found ourselves wondering if we were on the right trail. From parking continue 100 feet on Marble road to the gated snowmobile corridor on the right. Proceed through the gate and follow the snowmobile corridor. After 0.4 miles you'll reach a junction (shown with mini-dotted lines on the map). Bear right another 0.35 miles to the (unmarked) Bayle mountain trail (left). GPS coordinates N43 46.705, W71 14.714. The trail follows a small esker along a ridge before meeting up with the main Bayle Mtn trail. The trail is poorly marked and somewhat challenging to follow 0.57 miles to the Bayle summit. We didn't encounter many markings on trees or painted rocks which could be due to the May 2015 brush fire that consumed most of this mountain side. Charred remains of the destruction can still be seen along the way. Follow the trodden foot path (look for small cairns marking the way) as it ascends steeply through a large boulder field to where it parallels a large open slab to the mostly open and rocky summit proper. A summit register can be found about 100 feet from the summit facing Connor Pond. Bayle mountain is an excellent hike for kids. The distance is challenging but not overwhelming for young people and offers a technical boulder field to navigate which leads to beautiful panoramic views of the Ossipee Range. At 1853 Feet it is one of the lower elevation summits in the range but provides big reward for minimal effort. Mt. Shaw, the highest point in the range can be seen directly to the south, Ossipee Lake and Green Mountain are to the east. Bayle Mountain is ranked #8 on the Ossipee 10 list. Post-hike the kids enjoyed taking their shoes off and dipping their toes in Lovell Brook at the parking area.